Our hens are fed a special feed made with GMO-free wheat, barley, peas, and flax meal, and when we have extra milk or whey we feed it to them. They are kept on a pasture or rotated through our fields where they are able to eat greens and insects every day and take dust baths in the sun (when it’s sunny). They lay their eggs inside their cozy mobile homes in straw-filled nests. 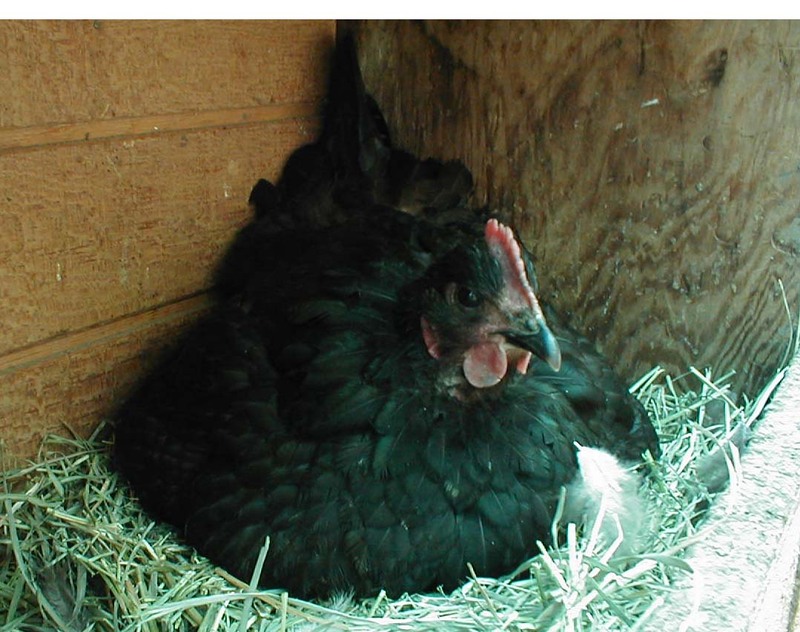 Egg production is directly related to daylength. When the days are long the hens lay more eggs, and when days are short they lay less. You see, the chicken’s egg cycle is about 25 hours long, and they will only let their eggs go during daylight hours. Commercially, artificial light is kept on the hens 24 hours a day, so they do lay an egg every 25 hours, no matter what time it is outside. Without artificial light, the hen will lay her eggs every 25 hours—however, if the 25th hour falls in darkness, she will hold the egg in her body until the next daylight period begins. A hen in her nest, getting ready for her daily labor. For example, this is Camilla. Let’s say today is March 1. Camilla lays her first egg at 5:00pm on a bright sunny afternoon and she’s pretty happy as she announces it to the world. Her egg-clock already begins ticking away another 25 hours, and when her internal timer goes off it’s 6:00pm. She clucks away and announces her accomplishment. Tick-tock, tick-tock, another day passes—this time, it’s 7:00pm and it’s getting dark, so she holds her egg until it gets light at 7:00am—she skipped a day. Her next egg is complete at 2:00am, but she waits again until morning comes. This continues until finally she gets a break at the fourth and seventh day of the cycle. At this rate, she’s laying five eggs in seven days. I guess we’ll keep Camilla around! A flock of 100 hens lays about 10 eggs each day in the winter, and up to 75 eggs each day in the late spring/early summer (around the summer solstice, when we have the longest day of the year). When a hen has to hold an egg for a long period of time, her body is already making another egg to follow that first one. Occasionally the new egg will bump into the held egg and they merge. This is called a double-shell—when you crack one of these eggs it will appear to have two shell layers on the outside. Eggs are a “ perfect” food—one egg contains almost all the nutrients necessary for life, lacking only vitamin C.
The yolk is an oil-water emulsion containing proteins, fats, cholesterol, pigment and other minor nutrients. Most of the egg’s cholesterol and calories are in the yolk. The white is made up of water mixed with several different kinds of protein. Egg protein is complete, since it contains all essential amino acids. It is among the highest quality proteins found in food, second only to mother’s milk. Also contained in the white is lecithin, which acts as an emulsifier (for making mayonnaise), and also affects human brain function. It also breaks down cholesterol, so as long as both parts of the egg are eaten as one, there is no net cholesterol increase in the human body. One large egg contains about 6.25 grams of protein, roughly 15% of the U.S. RDA. A single large egg is roughly equivalent in protein to 1 ounce of lean meat, poultry, fish or legumes. Eggs with colored shells are not more nutritious than eggs with white shells. Shell color has nothing to do with food value, it just dresses them up. The breeds that lay white-shelled eggs are more prolific and eat less feed, so they were the more profitable choice for factory farming here in the U.S. In Japan, white eggs are shunned—they are as uncommon as brown eggs used to be here.